Taking much of the fun out of life for kids. Running many parents close to bankruptcy. Segregating kids on the basis of all kinds of ability levels and interests (which may be their own interests, or the ones that adults think that they should have). Making us more of a militaristic society. Possibly reducing empathy in the body politic because we’re so competitive. I remember playing one year of little league baseball, but couldn’t wait for it to end because the coaches were so didactic and seemingly inhumane. Fortunately, in high school, the coaches I had were warmer (and probably more knowledgeable) but then again, my football coaches were largely shouters and sometimes beraters. When I think of playing baseball or football as a kid, I think of playing one-on-one baseball on the campus of Washington University in St. Louis, using a big tree on the quadrangle as our combination catcher, backstop. Later we moved to stickball (a great sport because it doesn’t hurt when you get hit in the head with a tennis ball). We learned to umpire for ourselves and make up other rules on the fly. In the fall, we switched to touch football. We seemed to have an awareness of the beauty of making it democratic; allowing everyone into the game. We made up bizarre plays, and would draw up more of them when bored in class. It was sport based on getting along with friends, because what could be better than sports and friends? 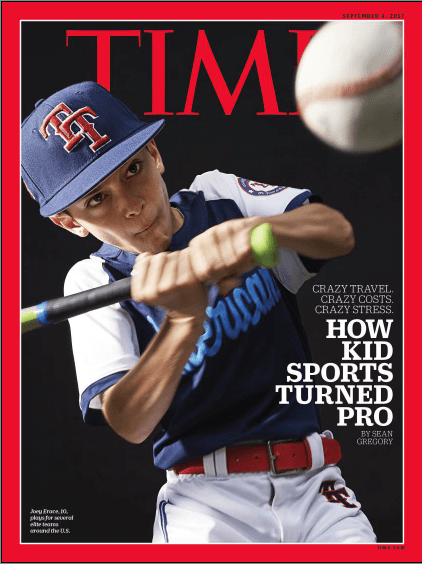 I was reminded of this a couple of weeks ago with a Harry Smith report on NBC about kids enjoying baseball in what really is a “league of their own.” No adults allowed; just play ball with friends. As no surprise to anyone, sports are no longer games in the generic sense of the term. Instead, they are part of an industry that milks players, parents, consumers, and society of $15 billion a year. The dollars go in, and for many, the joy goes out. But the big question is what does this mean to our society? The growth of organized sports for kids comes at a time when increasing pressuring suffocates kids from all directions. In some schools, homework begins in kindergarten. As students get a few years old, specialty camps seek the most talented kids, whether it is in art, drama, or even test-taking. Misguided federal intervention into education by the George W. Bush and Obama Administrations turned schools into test factories, not so much for the students, but more so for the teachers, administrators, and ultimately bragging rights for the parents in the district. But it was the kids who paid the price. For a kid who would just like to learn some literature, history, math, science, social studies and lots of electives in high school, it is virtually an impossible task unless you want to get onto the treadmill of AP classes. It is as if nothing osmotically happens in learning; it all must be categorized and regurgitated for the tests. It may be that the tip-off as to what is happening comes to us from the Time headline about the $15 billion industry. There is money to be made by prescribing life for American kids playing sports, and the same is true as students become more performers for parents, teachers, and upcoming colleges. If we leave decisions about how we raise our kids to those who make money off these decisions, then we are in deep trouble. Can society ease up? Probably the best advocates for human rights for kids are the kids themselves. Kids, let us know what you really think. Previous Post:Houston flood: How much is 9 trillion gallons of water?